Roger Federer won his 7th Wimbledon title (tying Pete Sampras and William Renshaw) and record extending 17th grand slam title on Sunday at Centre Court, Wimbledon. A grand achievement, Federer defeated Andy Murray 4-6 7-5 6-3 6-4 in 3 hours 24 minutes. Furthermore, as he did after winning the 2009 Wimbledon final, the Swiss maestro has once again reclaimed the world #1 ranking. He will at least tie Pete Sampras’ record of 286 weeks at #1 (Federer previously 285 weeks). At 30 years and 335 days of age, the Swiss is the second oldest man to hold the top spot, behind Andre Agassi, who was 33 years and 131 days old. Adding to history at Wimbledon, Federer is 66-7 at the All England Club after playing in a record 8th final here. However, today’s final was much different from the two previous encounters in grand slam finals. Watched by Her Royal Highness The Duchess of Cambridge (Princess Kate), as well as the entire nation, nearly everyone was on edge for the match as the possibility of the first British champion at Wimbledon since Fred Perry was within sight. Both players had plenty of history to play for, and they were well aware of it. Murray had a previous 0-3 record in grand slam finals, losing two of them to Federer (US Open 2008, Australian Open 2010). Now coached by Ivan Lendl, Murray was showing signs of change at this year’s championships, playing more aggressively, and it showed in today’s match. He broke Federer in the first game and imposed his power game. The Swiss would have to react quickly, and he read the strategy well, similar to Roddick’s power game in the 2004 final, and his consistent play in the 2009 final. Federer broke back, but then at 4 all in the first set, Murray hit a passing shot right at the Swiss, who managed to get out of the way, but was perhaps shaken up a bit and soon broken again. The crowd erupted moments later, as Murray served out the first set 6-4. Both players stayed the course in the second set, but it was Federer who broke this time, at 5-6. In scintillating fashion, the Swiss maestro hit a carving backhand drop volley, showed a quiet fist pump, and it was one set all. Rain brought the covers on at 1 all in the third set, and on came the roof as well. It marked the first Wimbledon final played under the roof. Federer capitalized with the indoor conditions, but not before a marathon game lasting nearly twenty minutes where the Swiss had several break chances before finally converting. Perhaps the defining game of the match, Murray displayed his first signs of slipping. 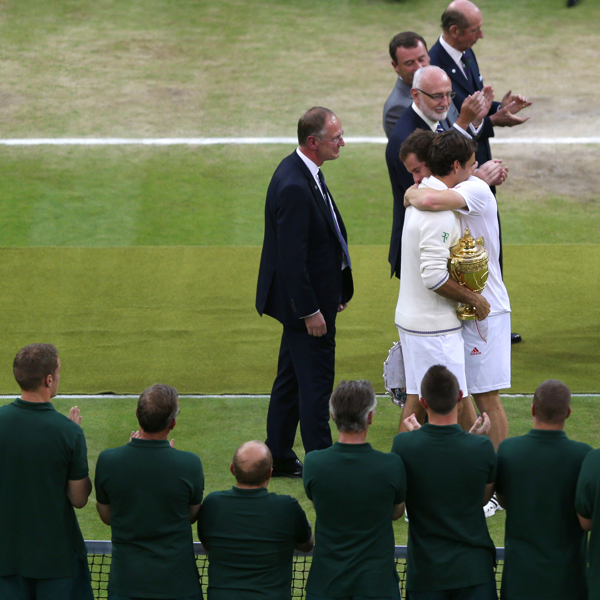 At last, Federer served out the championship, falling in emotion as a final Murray forehand sailed wide. An emotional trophy ceremony followed. It was unbearable to speak and express himself (Murray), as he choked up saying “I’m getting closer.” Federer consoled him between speeches, and now years of winning majors, he ended his own drought of over two years going slam-less. The Swiss maestro fired 12 aces, hit 62 winners, came to net 68 times, winning 78% of net points. For Federer, it is his 7th Wimbledon title, his record extending 17th grand slam. He has now reclaimed the world #1 ranking, an amazing feat for the Swiss star, exactly one month short of 31 years of age. He is now 46-6 in 2012 with 5 titles. Full match (highlights further below). 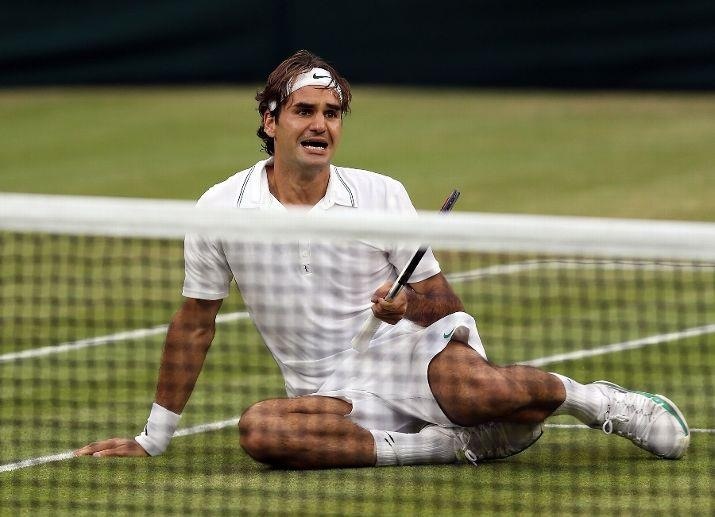 Federer serves for 7th Wimbledon championship. Murray emotional in trophy ceremony. Federer interview with Tennis Channel. In just three weeks, Federer will seek Olympic gold at the 2012 London Olympics, which will be played at the All England Club, Wimbledon.